The mule's training is progressive. That is to say, the mule advances from one level of training to a higher level. That is what education is all about - moving onto a more complex and more intricate level of performance. 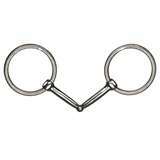 For the mule to advance in its training, it will move beyond the snaffle bit into a curb bit. In most associations, young, junior animals are shown in either a snaffle or a bosal. Both are training devices to start the mule. Nevertheless, once the mule has spent a certain amount of time in the snaffle and bosal, the associations require that the mule be moved up to the curb bit. This is not to gain more advantage for the rider, but to take the mule to a higher level of performance. The goal of training is to produce a FINISHED mule. A finished mule is one who is responsive to leg and rein cues in a leverage bit. A leverage bit is a curb with shanks. The shanks provide the leverage to a curb bit. A finished mule is beyond the pulling of the snaffle and now responds to the finesse of the rider and the subtle rein cues through the curb bit. Finesse means the mule is light in the bridle and willing. It means the rider gets the maximum amount of response from the mule with the least amount of pressure from the rider. The trainer achieves this when the mule is soft in the jaw and brings its nose into the rein cue through the bit. It is necessary for the mule to be taken out of the snaffle and begin to work in the curb to encourage the mule's overall development. The cues and control are more exacting and the mule is now ridden with one hand. Of course, the mule must already have a good foundation in the snaffle. If this is not the case, then moving to the curb will be confusing and pointless. Consequently, before moving up to the curb, make sure the mule has a solid foundation and is responsive and willing. Be sure the mule gives to the bit at the walk, trot and lope. Make sure it breaks at the poll and willingly accepts instruction from the bit. If your mule is receptive in the snaffle, it's time to progress to the more advanced cues with the curb. 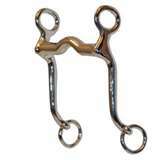 One ongoing debate between mule riders seems to be the difference between a snaffle and a curb bit. It' s very simple. The snaffle has no shanks - no leverage. The curb bit has shanks - leverage. The mouthpiece does not determine whether a bit is a snaffle or a curb. Many riders feel that any bit with a broken mouthpiece is a snaffle. On the contrary, the only distinguishing characteristic about a snaffle is that it does not have shanks. And a shank bit, no matter the kind of mouthpiece, is a curb. Both bits come in a variety of mouthpieces. You can find broken, Mullen mouth or straight mouthpieces in snaffles or curbs. The curbs, however, go on to an almost infinite continuation of mouth pieces used for different disciplines. Curb bits use a curb chain to add to the leverage. Snaffle bits may have a leather curb strap, but they are attached below the rein position and do not have any leverage action when the reins are used. A leather curb on a snaffle is used simply to keep the snaffle from being pulled through the mule's mouth. Just to add to the confusion, you will hear individuals refer to Tom Thumb Snaffles, Shanked Snaffles, Broken Leverage Bits and Curb Snaffles. The action of these bits is that of a curb because they have shanks and use a curb chain. The action of these bits is that of curb despite the broken mouthpiece. These are leverage, curbs, bits with a broken mouthpiece. Since they rotate the bit and cause the curb chain to tighten under the chin groove, it's a leverage bit. The snaffle bit affects the mule's lips, bars and tongue of the mule; while curb bits can act on up to five of the seven basic pressure points of the mule - chin groove, poll (via the bridle), bars, tongue and the roof of the mouth, the palate. Curb bits are designed to take a broke mule to a higher level of training. They are not designed for initial training. Snaffles and bosals are used for that. Curbs, on the other hand, are used to add that finesse in reining, that headset in Western Pleasure, that collection in Dressage and even that brilliance in harness. While a weekend trail rider may choose to keep his or her mule in the snaffle forever, those who compete on their mules are required to take their mules beyond the snaffle. 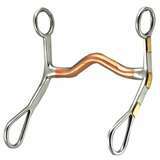 Many people think that shank bits are inherently more severe on the mule than snaffle bits. According to bit maker Greg Darnall of Loan Oak, Texas, the only thing that makes them bad is the hand that pulls on them. Even the snaffle in the wrong hands can become an instrument of extreme torture. So there is nothing in and of itself that makes the curb bit more cruel or more severe than the snaffle. On the contrary, the curb should be used to elicit the most subtle communication with the mule. In fact, by the time the mule moves up to the curb, he should be responding and be broke so well to the leg, seat and weight cues, that the curb is simply a method of refinement of movement. The fact of the matter is that the use of the curb bit should be relegated to the best broke mules and the most talented riders. The curb bit is designed, however, to apply leverage when the rider uses the reins. It does this through the use of shanks and a curb chain. The rotation of the bit when the rider uses the reins causes the leverage. The rotation engages the curb chain under the chin and causes the bit to press down in the mouth and the curb to press up into the chin groove. This is where the notion of severity is associated with the curb. Severity of the curb is determined, primarily, by the hands that are using it. Secondly, the shape and length of the shank affect the severity of the curb bit. But, most important, the ratio between the cheek piece above the mouthpiece and the shank below the mouthpiece should be considered in determining the severity of the curb bit. In the illustration to the right you can learn to calculate the leverage and severity of your curb bit as compared to others based on the shape of the shank and the ratio between length of cheek piece and shank. 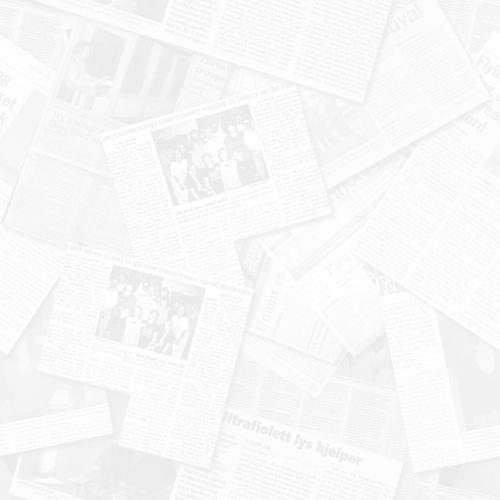 Keep in mind, if you have a low ratio of cheek piece to shank which makes it more severe, the severity may be reduced if the shank is sloped backward. 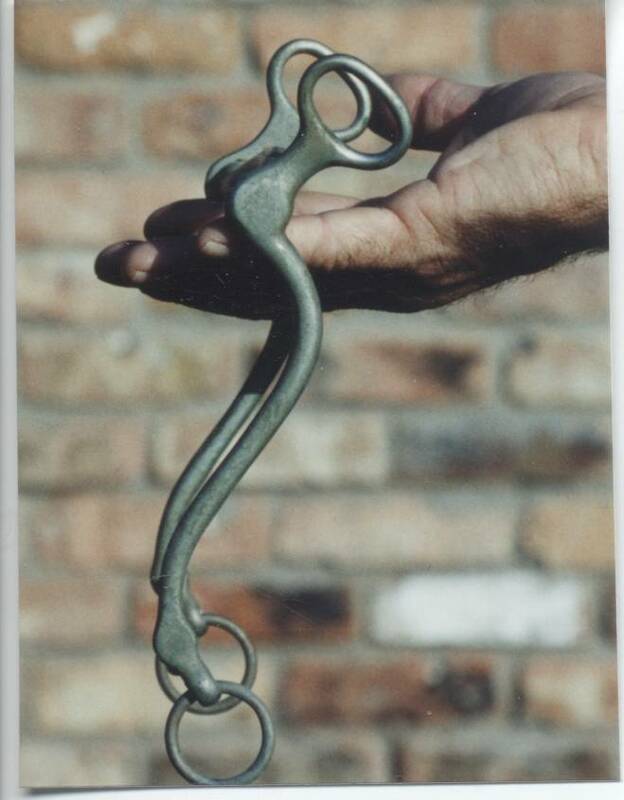 In addition, the added leverage of the curb chain also determines the severity of the western curb bit. As the curb bit begins to rotate in the mule's mouth as the rider engages the reins, the curb chain acts as a vice. Ideally, you want the curb bit to rotate 45 degrees before the action of the curb strap takes effect. This gives the mule some time to react correctly to the other cues before the curb reinforces the commands. Working on the sensitive tissues in the chin groove, the chain traps the lower jaw between itself and the bit. The tighter the curb the quicker the mule feels the signal. The general rule has been that you should be able to fit two fingers between the curb chain the chin groove. Curb chains or straps come in a variety of materials. They range from single to double chains, soft leather to rawhide, flat link chains to twisted links. Keep in mind always to check the curb strap if you are encountering resistance to the bit. A simple adjustment of a curb strap that is pinching too much or a change to another kind of curb strap could solve all your bitting problems. Never underestimate the effect of this small but important piece of tack. Curb bits can be found in two styles - solid shank and loose shanked. The loose shanked style allows some independence of movement of the shank at the mouthpiece. With both these, the message sent from the rider's hands to the mule's mouth must be filtered through the shanks, curb strap and mouthpiece. Unlike the snaffle, the message received from the curb is delayed by these structures. During the delay time, the rider is using the other aids of legs, seat and weight to communicate with the mule. This delay allows the bridle mule to set himself up and get ready to obey the commands. Everything about the structure of the curb bit revolves around this delay. It either lengthens the delay time or shortens it. Remember, in schooling and riding the mule in the curb bit, you are requesting a more complicated and discriminating reaction in the mule as you ask him to set himself up during the delay time. You don't want too short a delay if you are schooling and teaching and you don't want too long of a delay if your working or showing. Consequently, your choice of loose shanked or fixed shank curb will depend on your mule's level of training, the kind job he must do and your ability as a rider. The loose shanked curb simplifies learning as a young mule is moved up from the snaffle to the curb. Since there still is a certain amount of independent movement in the loose shanked curb bit, the rider can still use two hands for instruction as the mule learns the subtleties of the curb. In addition, the loose shanked curb delays the action a little longer to give the inexperienced mule time to get ready for the maneuver for which the rider is asking. The fixed shank gives little delay time and is appropriate for the very broke mule and th e very good rider. This type of shank is very unforgiving. Once engaged, it acts almost immediately. Consequently, in hands that tend to overact and move quickly, this bit gives the mule little chance to get things right before he's corrected. A mule that is hurt each time the bit is applied, will soon learn that the rider just wants to hurt his mouth. Eventually, the mule will develop into a hard mouth that can tug, lug and pull on the bit because there is no reward or release of pressure anyway. How the bit balances itself in the mule's mouth will affect how the mule carries its head. Balance means how the bit hangs in the mule's mouth when it is free of rein pressure. Rest the bit on your fingers. Allow it to hang naturally without holding it in place. The shanks will either hang straight down, roll forward or roll backward. Straight down is balanced. Forward is overbalanced. Backward is under balanced. Always perform this little experiment on a bit because two bits may have the same shanks, but be balanced very differently because the mouthpiece is attached differently. If you want your mule to go on the vertical, you will want a bit that hangs straight when the reins are slack. If you have a very light mule you want on the vertical, you will choose a bit that hangs a little forward (overbalanced) which gives curb strap release. The under balanced bit gives no curb release at all and might be appropriate for the mule who wants to nose out always. Considering a bit's balance might seem trite. And, it might seem that a mule couldn't tell the difference. However, when a mule is broke and ridden properly, the very slightest variation in bits should make a difference. For the mule who has learned to be light in the bridle, these very nuances are what can make the difference between a brilliant performance, a perfect slide, a perfect mulemanship pattern OR that immediate stop before you get in trouble on the trail. Never underestimate the importance of every aspect of your Western curb bit. It's your communication link to your mule. The more you know about your bit and the better you are at using it, the more your mule will give you the best rides of your life!